Cabbage rolls are a staple dish at many fall suppers and Christmas dinners across the prairies. 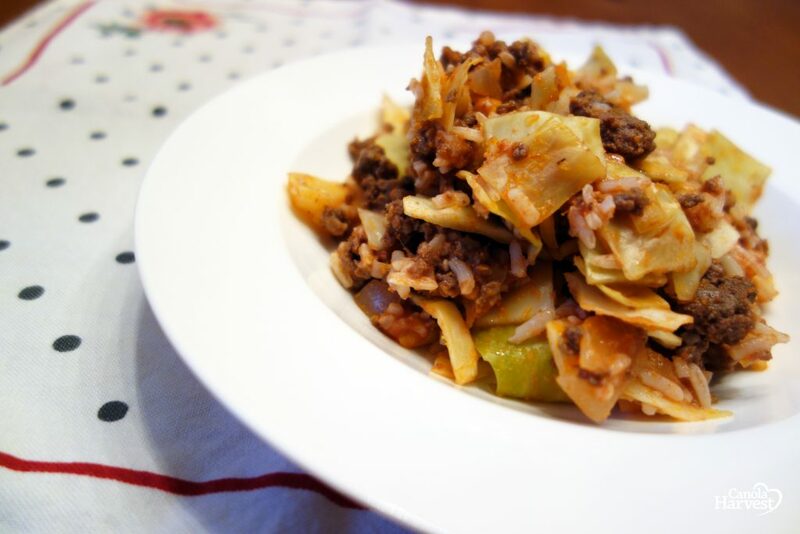 There are many varieties, since cabbage rolls are common in many parts of Europe, Iran, North Africa, West Asia and Northern China! Making this wonderful dish can be time-consuming, however a casserole version saves time and effort. Our one pot recipe is inspired by Polish and Ukrainian versions, and uses lean ground bison meat. If you’ve never tried bison before, the taste is very similar to beef. There are many health benefits to cooking with bison- it’s lower in cholesterol than chicken, and contains twice the amount of iron than beef. Furthermore, it’s considered a sustainable source of protein.The North American Bison has thrived on the prairies for thousands of years, until their population was decreased drastically in the late 1800s. Today, bison are no longer endangered. They continue to graze on open ranges from Alberta, Canada, and Mexico, and play a crucial role in protecting, preserving, and defining the environment which they live in. If you can’t find ground bison near you, extra lean ground beef and ground turkey also work well. 1. Heat Canola Harvest oil on medium-high heat. Add ground bison, stir and break up meat for approximately 5 minutes, ensuring all pieces are browned. 2. Stir in salt, pepper, onion, and garlic. Add tomato sauce, and about ½ cup of the water. Cover and cook on low for 20 minutes. 3. Add the cooked brown rice and chopped cabbage, stirring well. Add the rest of the water if needed. Cook on medium for 10 minutes, or until cabbage is tender. Serve topped with sour cream and chopped green onions, if desired. © 2018 Richardson Food & Ingredients. All rights reserved.